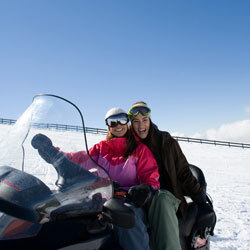 Protecting yourself with the right snowmobile insurance policy will allow you to enjoy your time on the snow with real peace of mind. We can help you secure a snowmobile policy at relatively affordable rates from some of the top snowmobile insurers in the nation. Some of the main insurance coverage offered in a snowmobile policy includes collision, comprehensive, property damage, bodily injury, and uninsured motorist. The collision coverage will help pay for damage to your snowmobile from a collision with another sled, rocks, trees, and other obstacles. The comprehensive coverage will help pay for loss or damage to your snowmobile from theft, fire, vandalism, or other covered perils. Property damage coverage will pay for damage caused to others property and bodily injury coverage will pay for others medical expenses if you are found to be at fault in an accident. Lastly, the uninsured motorist coverage will help pay for damage caused by uninsured or underinsured riders. Moreover, some insurers also offer additional coverage for custom equipment added to your snowmobile and medical payments for you and your passengers regardless of who's at fault in an accident. Completing qualifying safety courses or insuring multiple snowmobiles, motorcycles, or ATVs on one policy can often give you additional discounts. Call us now to request your Snowmobile Insurance quote proposal from an agency that strives to consistently provide our customers with superior coverage, service and savings.